Before we moved in, I knew I wanted to refinish the hardwood floors. We sanded and stained our floors in our old house-you can see evidence here. We did it once, and that's enough to know that we won't do it again :) I just didn't like having our house in disarray for so long and this was a lot bigger of a job-it would have taken us amateurs forever. The benefit of doing it right when we moved in was that we didn't have any furniture on our first floor. We just left everything in the garage. Before we moved in, we went to the house for a home inspection-now, I know a lot of people don't go to this appointment, but I don't know why.. it was the perfect opportunity for my husband to walk around with the inspector and see what things needed to be fixed, he then could tell my husband how to fix simple things and what things to push for in negotiations with the sellers. It was also a perfect time for me to set up an appointment with the flooring guy to come over and get a quote. So, my husband walked around with the floor guy to tell him of our plans and we were able to get a quote and an appointment for them to fix our floors, before we even moved in. 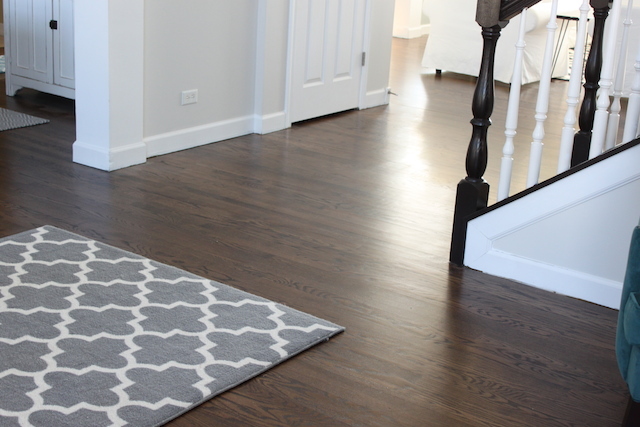 Dark floors are pretty popular right now, below are three of my favorite stain colors-and what I was deciding between.